As much as I hate to admit it, I can't deny the fact that summer is starting to transition into fall, as evidenced by the fact that socks, boots, and sweaters all came out of my closet this week. Now, fall is actually my favorite season, but I don't like seeing the end of summer veggies and fruits, especially tomatoes. This time of year is when I eat as many tomatoes as possible, before it's too late and they're gone from the markets! Plum tomatoes are overflowing at the farmers' market now and they're pretty cheap, so now is the time to make big batches of tomato sauce to eat immediately freeze for the cooler months ahead. 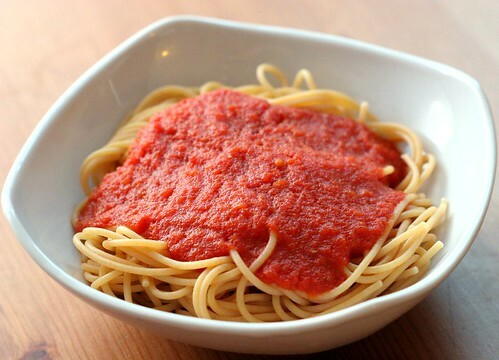 This is my go-to tomato sauce recipe, which I first saw on an episode of Good Eats. The tomatoes are roasted at medium heat for a couple hours, then at high heat for a bit so that they caramelize, to deepen the flavor. Then they are put through a food mill, and the resulting peel-free puree is simmered with some white wine, to draw out alcohol-soluble flavor compounds, according to Alton Brown. The first time I made this was a complete disaster. First, I used out-of-season tomatoes, which barely had any flavor (*shaking my head at the cluelessness of my former self*). I didn't have a food mill, so I threw the roasted tomatoes in the blender, which meant all the burned caramelized bits and skins got mixed into the sauce. And I didn't have any white wine around, so I used vermouth, which did not work well. I ended up with a very boozy, bitter, burned sauce that didn't even taste like tomatoes. Oh boy. Seriously, it was bad. Once I got a food mill, I tried the recipe again with much more success and have since made some modifications. I don't bother with onions, garlic, or herbs during the roasting, and I cut down on the amount of wine by quite a lot. The result is a sauce with pure, sweet tomato flavor, with some extra depth from the wine. It's really pretty great. Preheat oven to 325 deg F. Place tomatoes on baking pans or sheets, cut side up. Drizzle with olive oil and sprinkle with salt and pepper. Roast tomatoes in preheated oven for 2 hours, then turn heat up to 400 deg F and roast for 30 minutes more. Check tomatoes after 20 minutes - if they have caramelized and seem to be beginning to burn, remove them from the oven. Pass tomatoes through the medium grate of a food mill into a small saucepan. Discard skins, seeds, and anything else that remains in the food mill. Add wine and bring sauce to a boil. Reduce heat and simmer for 5 minutes. *I do not seed the tomatoes, since the food mill filters out most of the seeds anyway. However a few seeds do get through. If you want your sauce to be 100% seed-free, then seed the tomatoes before roasting.